For over 50 years, we have been a well-known part of Berlin’s economy. The portfolio stretches from classical commercial complexes with brick façade to modern commercial parks. GSG spaces are variable in usage. Regardless of whether office, production or storage, small and medium-sized businesses are able to find the right premises from 20 to 20,000 m², growth included. For more than 50 years, GSG Berlin has been the contact for small and medium sized companies. Our classic commercial complexes and modern business parks can be found throughout Berlin. We are one of the leading and largest providers of office and commercial space in Berlin. You will find a large number of companies in all industries in our industrial estates. "The approx. 2,000 tenants of the GSG are a very special and diverse mixture of the Berlin middle class. If you were to expose all of our tenants on a deserted island, you probably would not have to worry about your future, as the potential for synergies and collaboration is so diverse. This is not only fascinating, but probably unique in its form in Berlin. " For 50 years, Gewerbesiedlungs-Gesellschaft (GSG) has been a well-known part of Berlin’s economy. Student protests and squatters, the fall of the Wall and the government relocation, New Economy and its crash, cluster strategy and startup boom – catchphrases such as these represent not only the exciting history of Berlin but also that of GSG over the last fifty years. The continuous work of GSG is closely linked to the development of the city and, in particular, to that of the Berlin industry. GSG has always been an important part of Berlin’s urban and economic development. 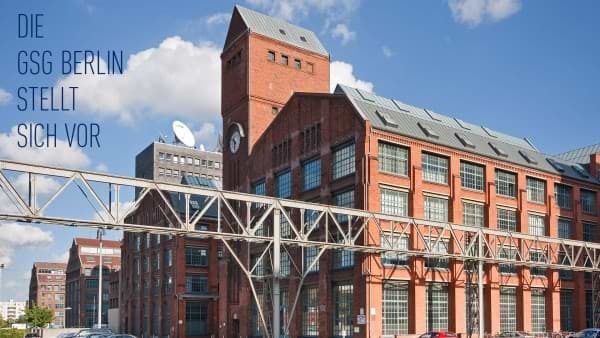 Here, at more than 40 locations, GSG offers small and medium-sized businesses, which form the backbone of Berlin’s economy, the right space to realize their business ideas. Not infrequently, products and services “made in Berlin” emerge, which often extend beyond the borders of the capital. At the end of February, GSG Solar, a wholly owned subsidiary of GSG Berlin, wins the real estate manager award 2016 in the category Management. This category recognizes companies that make a significant contribution to increasing the value or preserving the value of their portfolio with selected projects. The award-winning project encompasses the expansion of GSG Berlin’s business model by founding its subsidiary GSG Solar, an energy supply company with its own power plant portfolio. In June, GSG Berlin celebrates its 50th anniversary with tenants, employees and business partners. Berlin’s Governing Mayor also honors the history of GSG Berlin in his welcoming speech. Installation of the largest photovoltaic system in Berlin. The 43,000 square meter PV system “made in Berlin-Brandenburg” will generate 5,800,000 kWh of green electricity annually. The CO2 savings amount to about 5,000 tons annually. Opening of the first solar filling station in the Amperium am Humboldthain and commissioning of the first own combined heat and power plant. This saves 332 tonnes of CO2 per year. The GSG offers companies high-speed Internet with one of the first privately initiated fiber optic farm networks in Germany. Takeover of the GSG shares of the state of Berlin by the Orco Property Group (Orco) via its listed subsidiary Orco Germany and in cooperation with Morgan Stanley Real Estate. Completion of the refurbishment of the historic ensemble of the Royal Porcelain Manufactory (KPM), a highlight of the GSG’s 40-year refurbishment history. The first project of the GSG in the eastern districts of Berlin: The property at Wolfener Straße 36 in Berlin Marzahn-Hellersdorf became property of the Gewerbesiedlungs-Gesellschaft by means of the contribution from the state of Berlin. The GSG also built the complex with funds from the Joint Task “Improvement of the Regional Economic Structure” (GA). Laying of the foundation stone for the econopark Pankow on October 10, 1994. Settlement of the first Technology and Innovation Park in Germany (TIB) in the Amperium on the Humboldthain in Gustav-Meyer-Allee. First solitary building of GSG in Wupperstraße in Berlin-Zehlendorf. First new building of the GSG as a rounding of the object Prinzessinnenstraße 19-20, Berlin-Kreuzberg. Acquisition of the first commercial property in the Blücherstraße in Berlin-Kreuzberg. Trade needs affordable space – this insight led the Berlin Senate, the Berlin Chamber of Commerce and Industry and the Berlin Chamber of Crafts to take a pioneering step in 1965: Founding of Gewerbesiedlungs-Gesellschaft mbH (GSG). 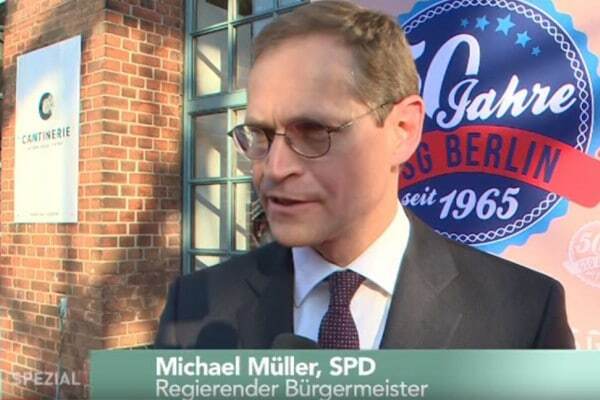 In this tv.berlin special on the occasion of the 50th anniversary of the GSG numerous Berlin personalities will speak, including the Berlin Mayor Michael Müller.